An Iphiclides podalirius in uska species han Lepidoptera nga syahan ginhulagway ni Linnaeus hadton 1758. 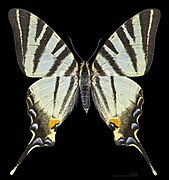 An Iphiclides podalirius in nahilalakip ha genus nga Iphiclides, ngan familia nga Papilionidae. Waray hini subspecies nga nakalista. ↑ Butler, A. G. (1865) Description of Six New Species of Diurnal Lepidoptera in the British Museum Collection., Butler, A. G. (1865) Description of Six New Species of Diurnal Lepidoptera in the British Museum Collection. Proceedings of the Scientific Meetings of the Zoological Society of London 1865 (2): 430-433; pl. 25. Ini nga pakli kataposan nga ginliwat dida han 09:41, 11 Mayo 2017.